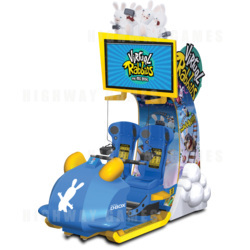 Virtual Rabbids The Big Ride was developed from the ground up by LAI Games – one of the most respected suppliers of arcade and FEC equipment in the world. It features the incredibly popular Rabbids licence – which is known to players across the globe. However, the biggest attraction from a customer perspective is that is can be operated like any other coin-op amusement game. Players take to their seats to enjoy a roller coaster style ride, full of twists turns, thrills and spills. It offers true 360-degree views with action in every direction, which cannot fail to excite players of all ages. The Big Ride was created in partnership with leading game developer Ubisoft and the attractive and practical cabinet design reflects LAI Games' time-honoured experience in game design. There are currently three experiences for players to choose from with more coming on board all the time – ensuring that this is an investment that will continue to command high cashbox. The Big Ride includes premium HTC VIVE headsets, accurate motion base by D-BOX and dynamic wind simulation. Each seat is monetised for maximum revenue potential and the unique audience-facing cabinet is a big draw for watching crowds.